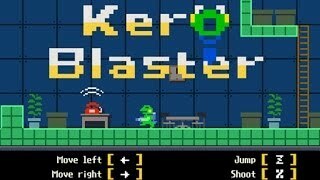 Kero Blaster on the Playism Store | Bringing a different breed of indie game to the world. Get ready for a ribbeting experience! C&F Inc. teleporters are going offline all over the place, and it's up to an intrepid frog employee to fix the situation. All users that purchase this title on Playism will receive both a DRM-free copy and a Steam key! An indie classically-styled 2D side scrolling action game packed with adventure. Starring a salaryman (bipedal frog) who collects a variety of weapons, fights outlandish monsters and visits strange lands on his business trips. Beating normal mode unlocks the challenging ZANGYOU (Overtime) mode, newly added as of October 2015. Fight for your life through a menagerie of unique monsters while getting your hands on exciting new tools of the trade. The game is also compatible with game controllers, if keyboard controls just aren't working out for you. We released the upgrade of Kero Blaster, "Kero Blaster ZANGYOU Mode" which has more stages than the original, vastly expanding the game. It's dense and perfectly paced, just begging to be replayed over and over. Kero Blaster is a magnificent run and gun, colorful, well-designed, offering a great curve of progression. Another state of the art Studio Pixel retro production. It's short. Very short. But it's also a great game that those looking for a retro-looking action game should definitely consider. An excellent run-and-gun shooter that plays beautifully on both PC and mobile; the only sticking point for some players will be its relatively short length. Regardless of how you may feel about frogs, be sure to give this indie game a try! Controls can be changed from the menu. The default controls are listed below. Gamepads are also supported out of the box! In case you experience performance issues while playing the game, the following fixes may help. 1. Check that the files have been fully extracted. 4. Try downloading the game itself a second time. There are cases where the game file itself is broken. 1. Try changing the screen size. Window mode can be toggled from the menu screen. 2. Change your Windows screen settings. This can improve performance. 3. Try updating your Windows driver. Performance can be improved by updating drivers related to graphics. You can change the control settings at the menu screen. Under default settings, press ESC to bring up the menu screen. Try starting up the game again without touching any of the buttons on your controller. Why I cannot play ZANGYOU mode? You need to beat the game first to play ZANGYOU mode. If you are having some troubles with this title, please do not hesitate to check out our Help pages or contact us about it! What do you think about Kero Blaster? Let everyone know your impressions about this product! You can either give only a score number or a more detailed overview. You need to select a rating for this game. Your review was successfully published.If you have any questions, please contact us. We could not complete your request because an error occurred. Studio Pixel, famous for Japanese indie game Cave Story, specializes in creating immersive worlds using retro graphics and plenty of style. Welcome to the new Playism site. If this is your first time logging in, you will need to reset your password to reclaim your account. Register now for an account on Playism and gain access to hundreds of great indie games! To register an account, please choose a username and password. We could not complete your request because some fields were not properly filled in. If you have any questions, please contact us. To complete your registration, an activation link was sent to your e-mail address. Do not forget to check your spam folder.